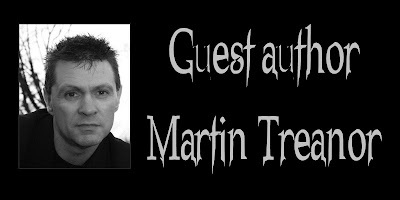 Please welcome today's guest author Martin Treanor! Martin is the author of The Silver Mist, Who's Charlie featured in the Spinetingler Anthology of Short Stories , and contributed to They Bite . It was a supernatural piece, based on the idea of invisible friends in childhood. It took many years, and much editing, before it found its readership. I had sold quite a number of other stories before I thought to resurrect the story, and was lucky enough to secure publication in ‘Spinetingler’, along with a place in that years’ anthology - and also a flattering review by multi Bram Stoker Award winner, Jonathan Mayberry. Martin: That would be my compulsive desire to discover new things. I am one of those who are curious, to the point of obsession, about anything and everything - the more obscure the better - and what could be more obscure than the mysterious world of our dark and hidden selves. For me, the realm of the psyche is a universe in itself, a place of creation and death. What lies inside, we project into the outside world, and perhaps our perceptions are such that they manifest as matter and reality. These are the paradigms that I explore in my books and stories, and which feature strongly in my forthcoming novel, ‘The Silver Mist’. Most people prefer to sever the connection with the otherworld of their souls, viewing it as a place too dark and veiled to consider. For me, it’s a compulsion - the need to ask, ‘What if?’ I’m compelled to take that journey inward, to examine what comes into existence - and, if it arrives with sinister undertones, then all the better. Martin: Ah! Good one. I think that, if I could have any single supernatural talent, it would be telekinesis. This is something that has always fascinated me since I was a kid, my childhood brain twisted and swelled with movie images of people who could move and do external things with their mind - especially ‘Carrie’, and following that, ‘Firestarter’ and ‘Scanners’. It is something that crops up to a small degree in some of my work and, if I had such ability, would use it hang the blasted washing on the clothesline, something that peeves me no end. Martin: Normally, I theme my stories on the traditional patterns of the supernatural - albeit through a speculative approach. With ‘The Silver Mist’ though, I wanted to go further than the classic archetype, and consider the deeper essence of the psyche, the foundations of mind and matter, and open for an alternative explanation to the established definitions of existence. I chose to address this through the eyes of someone who would be seen as being at the fringes of society. In many ways a hidden person who, in turn, views the world from an alternative perspective, allowing for the story to develop through her understanding of the reality in which she exists, bringing forth all the dark implications that such understanding might invoke. The reader is taken on a journey - well a series of journeys - down to the secret recesses of the soul and, just as the main character comes face to face with the unseen aspects of her own inner fears, so the reader is exposed to the murky world within us all - or perhaps outside … or maybe both? Martin: With regards ’The Silver Mist’, for the leading role, I would cast Irish actress, Elaine Cassidy - it would probably involve an good degree of facial effects, however she has a style and finesse that would fit the part perfectly - as ‘Runt’ in ‘Disco Pigs’, with Cillian Murphy, she was excellent. If I remember right, she won an award for that role. As the supporting character, I would cast another Irish actress, Laura Pyper, whose eyes are so alive, and she performed a fabulous Jane Fairfax in the BBC’s 2009 adaptation of ‘Emma’. As to another of my novels - as yet unpublished - working title: ‘Drawn to the Dark’ - I would cast Ellen Page in the lead role - she was brilliant in ‘Inception’ - and, for the three main supporting roles, I’d cast English actor John Simm (so nefarious as ‘The Master’ in ‘Doctor Who’), English actress Naomi Harris (Tia Dalma in ‘The Pirates of the Caribbean’), and iconic Irish actress, Brenda Fricker - who I would also cast in ‘The Silver Mist’. I just wouldn’t like to be picking up the pay-bill. The Bite Before Christmas special treat! Martin has graciously offered us a chance to read his holiday short story 'Not A Scratch' here. Thank you Martin for joining us here at From the Shadows! To learn more about Martin Treanor and his books, please visit his website. I luckily discovered Martin Treanor's stories by being on the Goodreads site. So far, I've read the short stories published on his website including the one posted here, "Without A Scratch". This author can pack a punch you won’t forget in just a few paragraphs! I think Martin Treanor is one of the most outstanding 'horror' authors writing today and encourage everyone to give his works a read...you won't be sorry! His writing has a literary timelessness with a creepy fright factor that those of us craving a good scare won’t soon forget. I can’t wait to get and read his upcoming novel, “The Silver Mist”, and from reading this interview am glad to find out a bit of what the tale is about. I’m also excited to read that the author is working on his next novel, “Drawn To The Dark”! Anyone appreciating exquisitely written, hauntingly unique tales will want to read Martin Treanor’s short stories and novels. Thanks so much for the interview, E.J. and Martin. It’s always intriguing to find out what an author feels is important and what motivates their writing. This talented author is going places! I would like to thank everyone who stopped by to read my ravings about my books, stories, and writing in general. I apologise for not getting here earlier - but England has become somewhat lost underneath one seriously large pile of snow, the upturn of which being most roads and rail services are practically at a standstill. I managed to get home though - so, as I say, many thanks for dropping by - I hope you enjoyed my little Christmas chiller, and I would like to wish everyone seasonal greetings, and only the greatest success for the new year.